A brush fire erupted next to Calgrove Boulevard and the 5 Freeway in Santa Clarita on Wednesday, June 24, 2015. 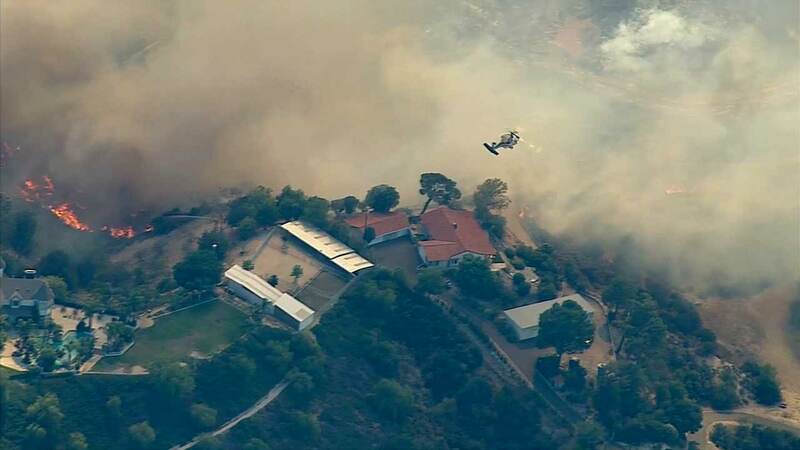 SANTA CLARITA, Calif. -- A fast-moving brush fire erupted next to the 5 Freeway in Santa Clarita near a mobile home park Wednesday afternoon, prompting hundreds of evacuations. 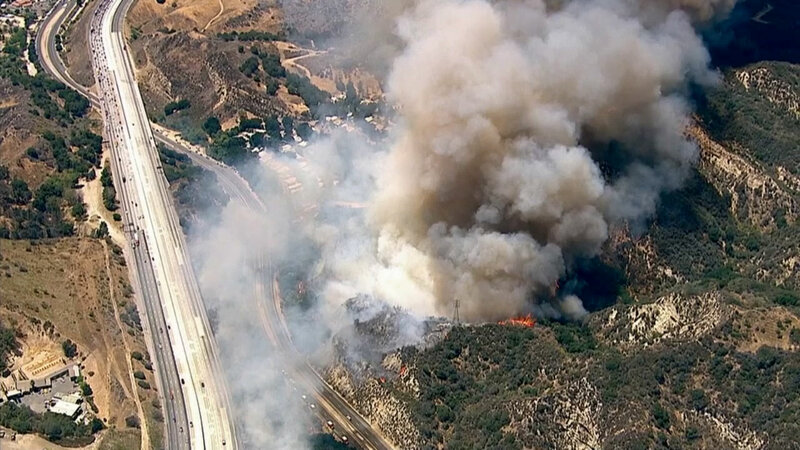 The Calgrove Fire erupted next to I-5 lanes, just north of SR-14, and has scorched 100 acres. About 300 Los Angeles city, county and U.S. Forest Service crews are battling the greater alarm fire. Two firefighters suffered minor injuries, according to Los Angeles County Fire officials. An ambulance was called out to the scene. A fast-moving brush fire erupted near Calgrove Boulevard and the 5 Freeway in the Santa Clarita area Wednesday, June 24, 2015. See photos. Fire officials say the mobile home park and single-family homes were threatened. No structures have been reported damaged. An evacuation center has been set up at West Ranch High School, 26255 W. Valencia Blvd., in Stevenson Ranch. An emergency animal evacuation center has also been set up at William S. Hart Park, 24151 Newhall Ave., in Newhall. Heavy brush is fueling the flames, which are surging through dry canyons near the Angeles National Forest. Five helicopters and fixed-wing air crafts are dropping 1,000 gallons of water at a time on the flames, which have sent up an enormous ridge of smoke. Both directions of the 5 Freeway were closed at times due to the firefight. The Old Road was also closed. California Institute of the Arts closed its campus in Valencia for the rest of the afternoon due to the fire.